When calculating data in Excel, you may often find yourself in a situation when you need to pull data from another worksheet or even from a different Excel file. Can you do that? Of course, you can. You just need to create a link between the worksheets (within the same workbook or in different workbooks) by using what is called an external cell reference or a link. An external cell reference in Excel is nothing more than a reference to a cell or a range of cells outside the current worksheet. The main benefit of using an Excel external reference is that whenever the referenced cell(s) in another worksheet changes, the value returned by the external cell reference is automatically updated. Although external references in Excel are very similar to cell references, there are a few important differences. In this tutorial, we'll start with the basics and show how to create various external reference types with detailed steps, screenshots and formula examples. To reference a cell or range of cells in another worksheet in the same workbook, put the worksheet name followed by an exclamation mark (!) before the cell address. For example, to refer to cell A1 in Sheet2, you type Sheet2!A1. For example, to refer to cells A1:A10 in Sheet2, you type Sheet2!A1:A10. Note. If the worksheet name includes spaces or non-alphabetical characters, you must enclose it in single quotation marks. For example, an external reference to cell A1 in a worksheet named Project Milestones should read as follows: 'Project Milestones'!A1. When writing a formula that refers to cells in another worksheet, you can of course type that other sheet name followed by an exclamation point and a cell reference manually, but this would be a slow and error-prone way. Start typing a formula either in a destination cell or in the formula bar. Start typing the formula =19%* in cell B2 on sheet VAT. Note. When adding an Excel reference to another sheet using the above method, by default Microsoft Excel adds a relative reference (with no $ sign). 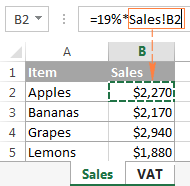 So, in the above example, you can just copy the formula to other cells in column B on sheet VAT, the cell references will adjust for each row, and you will have VAT for each product correctly calculated. This is how you reference another sheet in Excel. And now, let's see how you can refer to cells from a different workbook. File Path. It points to the drive and directory in which your Excel file is stored (D:\Reports\ in this example). Workbook Name. It includes the file extension (.xlsx, .xls, or .xslm) and is always enclosed in square brackets, like [Sales.xlsx] in the above formula. Sheet Name. This part of the Excel external reference includes the sheet name followed by an exclamation point where the referenced cell(s) is located (Jan! in this example). Cell Reference. It points to the actual cell or a range of cells referenced in your formula. If you've created an reference to another workbook when that workbook was open, and after that you closed the source workbook, your external workbook reference will get updated automatically to include the entire path. Note. When creating a reference to another workbook by selecting the cell(s) in it, Excel always inserts absolute cell references. Therefore, if you intend to copy the newly created formula to other cells, be sure to remove the dollar sign ($) from the cell references to turn them into relative or mixed references, depending on your purposes. To make an Excel external reference more compact, you can create a defined name in the source sheet, and then refer to that name from another sheet that resides in the same workbook or in a different workbook. To create a name in Excel, select all the cells you want to include, and then either go to the Formulas tab > Defined names group and click the Define name button, or press Ctrl + F3 and click New. In the New Name dialog, type any name you want (remember that spaces are not allowed in Excel names), and check if the correct range is displayed in the Refers to field. 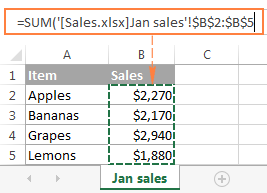 Once the name is created, you are free to use it in your external references in Excel. The format of such references is much simpler than the format of an Excel sheet reference and workbook reference discussed earlier, which makes the formulas with name references easier to comprehend. Note. By default, Excel names are created for the workbook level, please notice the Scope field in the screenshot above. But you can also make a specific worksheet level name by choosing a corresponding sheet from the Scope drop-down list. For Excel references, the scope of a name is very important because it determines the location within which the name is recognized. It's recommended that you always create workbook-level names (unless you have a specific reason not to), because they significantly simplify creating Excel external references, as illustrated in the following examples. Select the destination cell, enter the equal sign (=) and start typing your formula or calculation. If you are referring to a workbook-level name from another workbook, switch to that workbook. If the name resides in another sheet within the same workbook, skip this step. If you are making a reference to a worksheet-level name, navigate to that specific sheet either in the current or different workbook. Press F3 to open the Past Name dialog window, select the name you want to refer to, and click OK. Finish typing your formula or calculation and press the Enter key. Now that you know how to create an external reference in Excel, you can take a benefit from this great ability and use data from other worksheets and workbooks in your calculations. I thank you for reading and look forward to seeing you on our blog next week! 113 Responses to "How to create external reference in Excel to refer to another sheet or workbook"
I was wondering to link tables "formated as table" or named ranges in another workbooks! Is there a way of doing it?! In fact, you don't have to memorize the syntax of the structured reference. Simply select the cells in the table when typing your formula as you usually select ranges, and those names will appear in the formula automatically. As for a reference to a named range in another workbook, please see the following example in this tutorial: Referencing a name in another workbook. Is there any workaround while referencing closed workbooks? Cos, SUMIF and COUNTIF and Named Ranges isnt working, returning an error. That's the matter! Where "sales" is a named range in Book1. I did all this things, but none of them works fine! It might be something Office versions. I'm using 2016 version! And, does not work, even in another computer. If I use =SUM('D:\Documents\Book1.xlsx'!B:B) instead of =SUM('D:\Documents\Book1.xlsx'!sales), works!! Really weird! I have downloaded PowerQuery and it works! But, this SUM will be performed by another person, which may not like to use it. But I'll try to show this feature. And I can think of only one reason for the named range reference not working - you've created a worksheet-level name (please check the Scope parameter of your named range). If it is the case, then add a worksheet name to the reference. Hello: I have two worksheets. I have followed your naming convention in referncing another worksheet cell contents so that it shows in the 2nd worksheet. I have names and addresses, etc. in the first sheet. When I complete the formula, any blank cell in the first sheet is showing a "0" in the cell instead of keeping it blank. Is there something to put in the formula, or a way that will not show the zero unless there is actually a zero in the cell that I want to show? You can download the free add-in "Power Query" if you have Excel 2013. Once the link is established between the two excel sheets, workbooks within the network or even an external location, the excel workbook reading the data will automatically update once the source excel sheet is saved [whether open or closed]. Try this as this is very effective to produce reports for data flowing from other departments/braches etc., and even from the website. Below is an example of my formula. I cannot get 'EF$3' to automatically change to 'ef$4' when copying down a column? Because you fixed the row reference with the dollar sign. When you add $ in front of a column and/or row coordinate, it locks that coordinate(s), and the reference does not change no matter where the formula is moved or copied. Just change it to EF3 and the reference will adjust based on the relative position of a cell where the formula is copied. For more information about absolute and relative cell references, please check out the following tutorial: Why use dollar sign ($) in Excel formulas - absolute and relative cell references. hii....i just want to know whether i can get all the values of a data in a page by making any reference in a dropdown box...ie..... if i select any name created in a dropdown box, it should show all the values related to that name in another page. I have come up with a cell reference using the ADDRESS formula. Is there anyway to use this when referencing another sheet in a workbook? I added the & to show where I need to join the two halves of the reference. Thanks! I receive a number of excel files (on a weekly basis) and one file could have up to 1000 entries of items purchased.Information of 1 particular item is contained in 1 file. When i receive items, am supposed to extract information of particular items from the files i received. However, not all items received in a particular consignment are contained in one file, i would be forced to go through 10 files to get all the information. I would wish to come up with a file where i will only have to type in product code and container number and information is extracted from the weekly sheets stored in one folder. Hi, great, helpful posts. I was wondering if you could help me with an INDEX/MATCH problem where all the information I am referencing in sheet A is actually in sheet B, so only the cell/reference in sheet A in "MATCH" is actually in the sheet where I am building my function, but I cannot figure out a way to reference the column number correctly for the INDEX function as it resides in a different sheet simply typing the column number clearly does not work... Thank you! I would like to reference an entire tab in one worksheet as a tab in another worksheet. I have 4 tabs (1stwk, 2ndwk, 3rdwk, 4thwk) wherein I need the info from B2 of each tab to be totaled and entered on my final tab. I tried =SUM(April25!Sheet1!Sheet1!Sheet1!A7D9+April18!b2+April11!b2+April4!B2) but didn't work. What am I doing wrong? I have a unique problem, we created a [Planner.xlsx] template to enter our weekly sales. So instead of creating a new excel sheet every time, we save the template as a [Planner 25-04-16.xlsx]. We also have 3 other sheets to Planner.xlsx and save those sheets similarly as well. I recently started to externally reference the 3 sheets to Planner.xlsx and everything works fine. But when I save all the sheets as Planner 25-04-16.xlsx, Book1 25-04-16.xlsx, Book2 25-04-16.xlsx, and Book3 25-04-16.xlsx; the formulas still reference to PLanner.xlsx, but I want all of them to reference to the weekly sheets. Is there a way to do this without manually changing the references on a weekly basis. How about if you are working on excel online? Thank you. I am working with 2 sheets. One is taking all the information to the other. But, when I try to put in different order, it goes wrong. How can I do to have different SORT in both tables or sheets? Is there any way to have a variable within the file name of an external link? File A has cells that link to File B. The next month it needs to change from April to May. Rather than change the linking in each cell to point to the new file I would like to have a cell in file A where I just Type "May" instead of "April" and the links automatically update the file direction to May. Is there a way to set a value in an external reference. All of the examples I see so far are retrieving references from an external. I would like to be able to update the external value. Thanks a million! Note that it is much safer to use named references when linking to external sheets. I am working with 32 sheets. need to draw information from different sheets 6 times in each column. is there a way to name the sheet 1 time instead of naming the sheet 6 times? there is only one other sheet for each column that data is drawn from. I tried "sheet name" in c5 and tried to write the formula =c5'!b23 with no luck. Your article is so useful and it helped me a lot learning insights of excel. How I can reference data from online uploaded excel sheet? I am facing another issue in referecning using Index & Match. When I pass a reference of one sheet in the second sheet, the value becomes visible and my formula works on it. But if I change the position of the column by inserting another column in the first excel sheet, the formula stops working. I have tried it to resolve by passing the "Name" of teh list as a reference in the 2nd sheet instead of Fixed column, but the issue is not resolved. Can anyone help on this? I want to refer a closed worksheet cell. How to put filename with using formula? I have a macro that displays the name of each sheet in a column at the end. I want to display the value of A1 for each of those sheets. How can I do that? I have worksheet sheet1,sheet2 and sheet3 with big data. this sheets were added together in "summary sheet"
but since my data is too big I can't manage doing all the rows and columns. so how can I state so that the whole "Summary sheet" add up sheet4 on the Previous one adding up same cells of sheet4 on it. I want to write a formula in one summary sheet of workbook, wherein the value comes from a fixed cell number of different sheets of the same work book. In other words the value of a fixed cell number gets updated in the summary sheet as and when new sheets gets updated. can I write a formula for adding sheets for sheet1, sheet2, sheet3 etc.. i.e. =sheet1+1!H37!! Hi I have created a spreadsheet in Excel to control when employee's certifications are expiring. Then I have created seperate folders for each employee that contains the picture of the certifications. So I wanted to be able to click on the cell in excel and it be linked to the person's folder. The concern I have is obviously there are new employees added to this excel spreadsheet in alphabetical order. Therefore would the link automatically stay with the name? Example cell A2 is Doe, Jane but tomorrow that name could appear in cell A3. Is there a way to keep the link to the name? Hi I have created a spreadsheet in Excel to control when employee's certifications are expiring. Then I have created seperate folders for each employee that contains the picture of the certifications. So I wanted to be able to click on the cell in excel and it be linked to the person's folder. The concern I have is obviously there are new employees added to this excel spreadsheet in alphabetical order. Therefore would the link automatically stay with the name? Example cell A2 is Doe, Jane but tomorrow that name could appear in cell B2. Is there a way to keep the link to the name? Thank you so much! You are the only source out of dozens I have read that address how to enter the sheet name if there are blank spaces in the name of the sheet (by enclosing the sheet name with single quotation marks.) You have saved the day!! 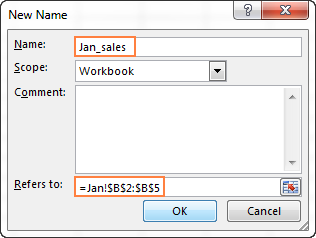 As mentioned in this thread, if I create a link in workbook A to another workbook B, Excel shows only the workbook name and cell address in the link. This link is updated to include the full path when workbook B is closed. Does anyone know how/if I can get the full path of the link while workbook B is open? I need to get the full path via VBA. Cant find any properties of the cell that give the full path until the source is closed. Hello, and thank you for the always help full posts. 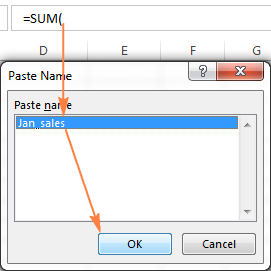 If the path for the source file in =SUM('C:\Documents\Sales.xlsx'!Jan_sales) is a named range (let's said srcpath )when entering this formula =SUM(srcpath!Jan_sales) I get the #REF error, why? Is there a way to reference cells of a CLOSED file in the same folder by using its name only, not the full path ? These files are inside a dropbox folder that is shared with team members, and the structure of dropbox means that the root elements of the path change with each individual, so the full path references don't work. Thx for the info and detailed explanation. I have an issue which i cant solve. I will be creating a new budget and workpapers from 2016 to 2017. When i copy 2016 and paste it and change the name to 2017, the links of over 200 workbooks stays at on the 2016 folder. I have to change the links of each file from 2016 to 2017 for each workpaper one by one.Is there a shorter way to do this? Thank you so much for your really useful post. Very clearly written too! I've successfully created links to other workbooks now but I would like the formatting of the original data to be carried through too and I'm really struggling with that. For example, if a colleague has categorised some data as 'category red' and highlighted the cell accordingly in their sheet (the one that my central sheet is linking to), the data come through but not formatting. Is there a way to reference a cell/cell range from a OneDrive Excel file? I read over the posts. I hope that I didn't overlook the exact answer to my question. I have a workbook with several Data sheets and 1 Totals sheet. Each data sheet has rows that contain updating totals as new data is entered, using a formula. These new totals would be in the same column but different rows. I would like the updated totals from each Data sheet to record on the Totals sheet in a specific cell. Therefore, I would need to add something to the end of the formula in the Data Sheets, that, after it calculates the new total, it also places that number in the Total sheet. Now, the problem that brought me to this specific article is whether an Excel workbook can work "as an interface" to another Excel workbook. I mean, one Excel file contains both some important and "basic" information along with instructions as to how use this data, but I want that Excel to remain "hidden" and only use its contents (both the information and the logics) in another Excel file. May I know about the serial number of first sheet reference to next sheet to 1,5,11,30,45 like that.How to use what formula. if a I have e sheet(01) with a row(row1) with formulas referring to another sheet(02) and I copy sheet(02) to another sheet(03) changing some datas (typically invoices) if I want to create another row(row2) in sheet(01) referring to sheet (03) it doesn't work, excel changes the cell referred and more important can I automatically say to the program to change all the formulas from the one I wrote manually for the sheet (02) to the ones of sheet (03) or do I need to do it manually for each cell? The user inputs a number and this references the sheet 'PIT Codes'to populate the sell with the corresponding code. Unfortunately we have had to introduce another size of PIT so I was wondering if I can make it check one of 2 sheets 'PIT Codes E' and 'PIT Codes D' the difference will be that the user inputs E1 or D1 depending which they have used. In case anyone else has a similar needs, I sorted this out by using Vlookup and define name for the range. I want to use some values from the sheet1 in a purchase into another workbook's newsheet. This works but if i change the values in sheet1(source sheet) means value in the newsheet which values are extracted from sheet1 also getting changed. And i want to make it unchangeable in the new sheet. Is there any possibilities for that? In this case, replace the formulas with their values to break the connection between the extracted and original values. 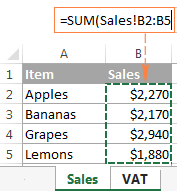 One of many possible ways to do this is Paste Special > Values (the detailed steps can be found here: How to copy values in Excel. I'm trying to copy cells containing formulas into a new workbook, but I'm getting this error. Hi i have define a few formula from sone external workbook. Is there any quick button or shortcut key for me to edit link of these external workbook to other external workbook? Hey gang...If a cell is desired to be empty on sheet 1, how can I not have a zero populated on sheet 2? But I am not able to find BGS HomeGuard Rate Sheet v2.01 0916.xlsx. But it returns a value when MSFGS is opened. Any error in the formula? Question: How to make an external reference and to get the full format from the referenced cell: number, alignment, font, border and fill formats? Is there a way or formula that can do that? The target is not to get only the value from the referenced cell, but also the apearence of that cell. The first I want to be a table that has all the ingredients i use in the first column, and then the Fat/Carb/Cal/Protein contents (1% of) in the subsequent columns directly relating to the quantity column at the end so I can change this value and all the macros will change accordingly. This I have managed to do. The second page, I want to have 6 individual tables laid out: INGREDIENT/CALORIES/CARBS/FAT/PROTEIN/QUANTITY. I would then like the ingredient column to be a drop down list that would include all the ingredients from the other sheet, and once selected, would autofill the remaining columns - this way I could easily add ingredients in the morning when I make up my meals for the day without having to individually input the stats. Any advice would be appreciated. I am linking a cell between worksheets in the same file. When I type the formula in the cell 'Sheet 1'!H11 the cell is populated with a 0 since the cell I am linking too is blank. How do I remove this 0 from the cell with the formula? The linked cell is blank until populated which will then be carried over to the other sheet. Currently i am preparing a job sheet in which i required help. As currently i have prepared 5 sheets in those sheets there are some different values or some similar values. Now i wanted to create one new sheet with such formula that if i will search any value then on that new sheet it will shows me the value location of all the 5 sheets that where it is placed. I wanted to do to save the time because for searching the values on whole workbook it consume time. For ex: I have value of OD56782 on 3 sheets out of 5. Now whenever i entered OD56782 on the new sheet it will display the locations of this particular value. I need sheet 1 entire values in sheet 2. Sheet 1 having datas but sheet 2 is empty in initial stage. While we giving conditions in sheet 2, fetching datas in sheet 1 has to come automatically in sheet 2. I have a sum that is derived using data from another workbook. However, when the other work book is closed. The formular reports an error. Both files are in the same folder on my desktop. Kindly assist. I have a spreadsheet that pulls information from one tab to another based on an if then formula. Is there a way to lock the information on the third page once it has been recorded even if it is deleted from the original tab? Hi thanks for the tutorial. is there a way for you name the sheet that a formula is getting its information from. for example im trying to find the cheapest vendor for a service i offer, their rates are on different work sheets, then i have a master sheet that displays the cheapest rates for each product using vlookup. is there a way of naming the sheet that vlookup has found the data in? this would help me very much thank you. if B2 is not available, i want to use the c2 to display the content coming from the sheet name IW39. if the c2 is not available, i want to use the B2 to display the content coming from the sheet name IW29. I will have 3 sheet. Namely "Data info", "IW39" AND "IW29"
I have 2 workbooks.. one I input data into, and the other logs who made the error.. is there a way I can make it so whenever I put someone's name into it, it will automatically update the second workbook with the date it happened and how many? I have 2 different workbooks that I am trying to link that have different file paths. I have a "Log" and a "Tracking" workbook. In the "log" there are hyperlinks only in column B that show as numbers because they reference what the next document # should be (0001-5000). When you click on the hyperlink to open up the excel file (tracking document), I need it to always have that reference #. Example- If I click 0005 and the hyperlink opens the tracking workbook, then I need it to have 0005 in a certain cell. This goes for the same way for every number that you can click. How do I link these workbooks together so that the tracking document always has the number that you click on? Im an intern at an engineering company in the Netherlands and working on my 'personal investigetion'. I'd like to apolagize in advace for any mistakes regarding my English. At the moment I've exported a shedule from Revit2016 to Excel2016. It has 8 rows of information (headings excluded) and 62 columns. It's my intention to make a seperate Format in Excel which is able to extract data from these 496 cells and convert it into grouped Metadata. The problem is that a Format has to be able to be apliccable to every project, each of them with their own specific number of rows (column headings are identical). Besides, the workbook_names from which the data is extracted differ every time. I had the intention to create a worksheet with formula linking cells to the extract file, but to write the formula in such a way that it is easy to manipulate. For example: =('[Workbook_name]Worksheet_name!Cell_name') becomes =('[Cell_name]Cell_name!Cell_name) with the first two Cell_name referring to Cells within the current Worksheet in which the Workbook_name and Worksheet_name can be edited. Unfortunately I hit a brick wall, it doesn't work. Perhaps I'm not doing it right or it just isn't possible. If someone is able to help, please do! I've got to have the Format ready a week from now (with 01-06-2016 being today). My question is: I have a spreadsheet that has two tabs. I want the first tab to pull appointment dates from the second tab if the patient names on both tabs match up. How do I do this to save myself countless hours? Thank you in advance for your assistance. Rajesh Kumar was able to figure out how to do the formula that I need to save me countless hours! Thank you so much. Can't find info regarding the action of excel reference to another ONLINE workbook. I am having two different workbooks non related and trying to gather results from workbook one to be displayed in the workbook two. The problem faced by me in excel is regarding linking of cells.actually what happens is after linking a cell in excel from same workbook but from other sheet,and clicking on the linked cell just shows the path and does not open the linked path. The Problem faced by me in excel that I have a sheet in which some things typed i want that on another sheet i type first name one a time and complete things automatic come. and next time when that name enter on first sheet other sheet automatic update without putting name. I have 2 Sheets, Sheet1 is for record entry with SAVE RECORD button and once button is clicked it updates record in Sheet2 which works well, but the problem is that after SAVE RECORD button click it display sheet2 where the data is saved which i do not want. I need Record to be saved without displaying sheet2. please help me. How do I do a comparison? For example, I have 'sheetA' that has a unique value in cell D1. I then have sheetB that has a list of values in column D.
I want to set something that will flag cell D1 in sheetA green if it shown in column D of sheetB, or red if that value is not shown in that column. Hello I receive an excel file but when I open the file , it says, This workbook contains links to one or more external sources that could be unsafe. If you trust the links, update or dont update. There is an error: source not found . There is a file from the link that i couldnt find, i have only receive one file for example file1.xlsm and the on the edit link it is looking for example file2.xlsm. Does this mean i need to create a new file formula ? Thank you very much i new to this thing. Hi! Just have a further query: I'm required to fill out two timesheets for work with the same times, and have successfully used your 'External reference to a closed workbook' guide above to fill out the second timesheet with the times automatically pulled from the first timesheet. However, the 'first timesheet'/reference workbook has each weekly entry made as a new tab/worksheet (i.e. each worksheet in the source workbook covers a week and is named with a date range), so in my second timesheet, I have to update the workbook name in every since relevant cell each week to get it to fill out automatically. is there a way to reference merely the top-level/latest worksheet rather than the specific sheet name, so I don't have to change it manually? i need help, is it possible to link a cell from sheet1 to the values on sheet2? ?for example if i input a name on sheet1 cell A1 and matches a name on a list on sheet2 then the name will turn to " color red" or "error" if matches? ?thanks in advance.. I don't want to add the values using the SUM formula, I just want to copy the cell values from another workbook. how do i do this. You can add references to values from another workbook by copying the cell values from this workbook and pasting them into the workbook you need via Paste Special –> Paste Link. hello. i am confused. what i am doing is exactly what is stated in the above examples. however, instead of the actual value, the formula text is the one displayed. ex. =sheet1!h10 displays sheet1!h10 instead of the value of the cell. is there a workaround on this? I want to use Sheet 1 to enter data, Sheet 2 to store formulas, and Sheet 3 to store the calculated output from Sheet 1 data modified by the formulas in Sheet 2. I am trying to sum values from one worksheet to another and its giving me 0 which is wrong.It copies the cell values and sheet name correctly in sum but as soon as i press enter,it turns to 0. Hello, I wanna know if we can make a relative folder referencing? Like, I want to sum the cells from the parental folders? I am trying to reference a sheet within the same workbook by entering the following formula : =Sum('Monthly Bill (OCT)'!C2:D2) I receive a #REF response. Can you help me figure out whats wrong with my formula. i have two sheets in a work book i.e Sheet1 and sheet2. in sheet1 i have the data and in sheet2 i have put "sumifs "formula and it works.now i have to delete the data in sheet1 and update new data of the same type. but when i do this the formula doesn't work in sheet2. Hello mam, i really need your kind support..
What if i wrote date January 23, 2018 for example and i want automatically on the other sheet, the column for january in the other sheet will have color depend on what i desire. please..
for February same above will happen. How to reference external several files? There are 10 files named A001, A002, ...., A010. Can I make the file names in general instead of typing each name on an another excel file? My idea is that to have excel search the correct file and reference the cell value. this rows around 800 so each like checking is difficult, IF any answer removed, the final cell it has to show removed. I have created a "Database" workbook to use as my source workbook and linked it to other workbooks as reference, in the hopes that when I update the database, the information will be pulled to other workbooks. I understand that the "database" workbook has to be opened at the same time as the workbook that i am working with, but do both workbooks have to be in the same folder? I think the answer you want is at the bottom of the page in the #1 paragraph. The quickest way to copy data only from one sheet to another is to first copy the original data then in the new sheet right click where you want the data and select paste special values. I have a bit of a complicated question. Im doing a run-down of clients and basically need Sheet 1 A1-A10 (Clients names) to transfer to Sheet 2 A1-A10. But the catch is, I do not want the clients to erase from Sheet 2 when I delete them on Sheet 1. I need them to just pile down on Sheet 2 from A1- A90. Not sure how to though. Any help would be greatly appreciated. In Worksheet B I want to reference a cell in Worksheet A that is a sum of a list - let's call is cell B12. Can I add to that list in Worksheet A over time and have the reference work? When I do it now, Worksheet B picks up whatever is in B12, it doesn't adjust to know that the new sum is now in B14 because I added to lines to the list that is being summed up. Thanks! Can you please tell me if it is possible to link to an external workbook that has a name change each day. I want to draw information from multiple cells without having to rewrite the whole spreadsheet each day.